Meet our staff, 11 Macaws! 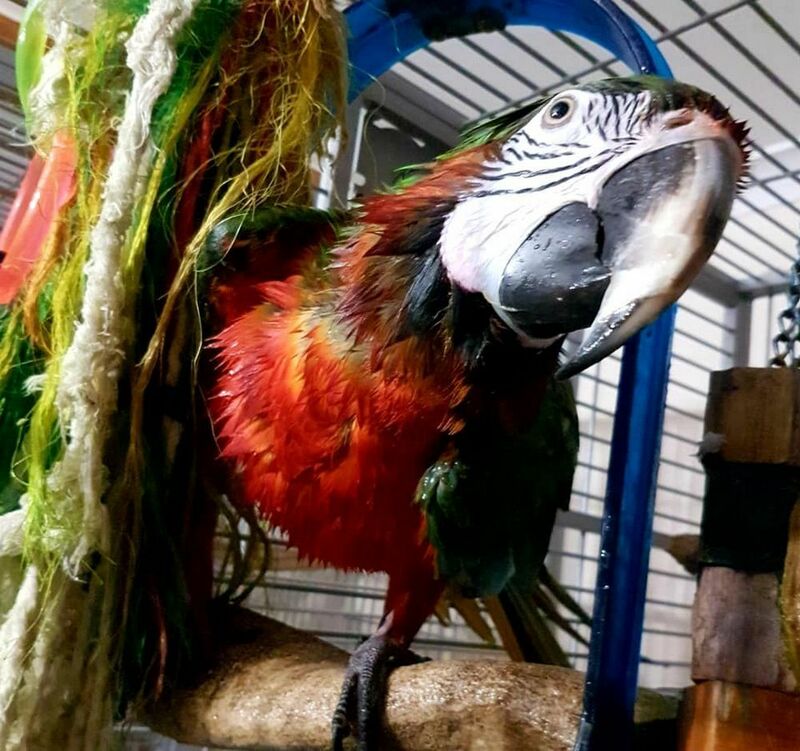 All rescue birds who have suffered varying degrees of abuse and neglect, all have had at least 3 previous owners, some many more. A bird is a lifelong commitment, and people just don`t realise that. Now they are with us in their forever homes where we will love and care for them for the rest of their lives. They have to earn their keep of course, we pay them peanuts...but they don`t mind! Oliver is the reason our business was started, hence his iconic face heading our website. 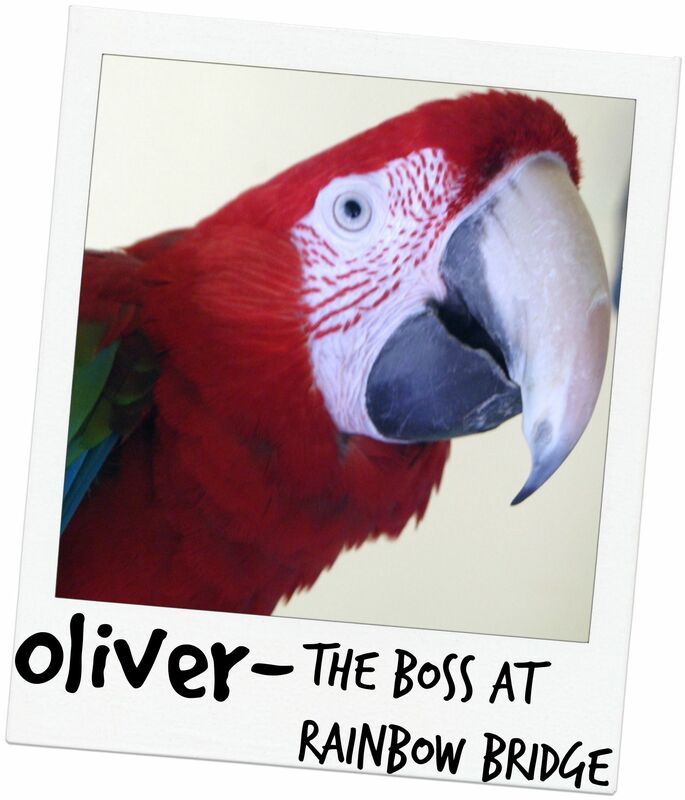 Oliver was a 16 year old Greenwing Macaw, we bought him from a garden centre with a story of how he was a tame pet bird but his cage had been knocked over by a young boy and he`d become afraid. We were naive and we fell for it, however it wasn`t long before the Parrot Society helped trace his ring details back to find he was a wild caught bird and on sexing they`d noted white plaques in his air sacks which wasn`t taken any further. Sadly Oliver now has Aspergillosis and respiratory Disease, along with severe scarring in his air sacks, All his ribs had been broken down one side of his body when he was very young, and had already healed but badly. Nobody knew how long we will have Oliver due to the scarring in his lungs, our vet was amazed he was able to breathe at all. Having said that Oliver was a huge bird full of kisses for everyone and with the help of Metacam and F10 fogging he enjoyed life to the full. Oliver was semi tame, he still didn`t like to be touched but enjoyed both bird and human company. Everyone loved Oliver, River was the love of his life, Diesel wanted to be his love and Molly flirted from the cage alongside them! He loved to hang upside down and play, he liked all toys, loved the fresh air in Summer and his spray baths. Olivers condition deteriorated over the years, he wheezed more noticeably at all times and wasn`t quite as well as he used to be. This was very worrying for us and we were in touch with our vets over it, though was nothing more anyone could really do for him. We just hope he knew how much we loved him and hope his life was happy for him. Tragically Oliver lost his fight in the late Summer of 2013. He was talking, eating and playing right up until a few days before his passing, and he died at home with both Tristan and I at his side, River and Diesel watching over him. His end was fast.Oliver will live on in 'Scarletts', he was the reason we started the business, it is his legacy and it is through him we ended up with our family. River is not employed for her intelligence bless her! As much as we love her she is clumsy and always the last to catch on!! We give her the puzzle toys to test and if River can solve it we know any bird can!! Still young she is 9 years old. She was not very well bred but is growing into a beautiful young lady with a lovely tangerine coloured chest and the prettiest colours. Sadly since we lost Oliver she misses him so much she has plucked all her beautiful feathers out. As she is maturing she`s a stubborn stroppy madam who takes no nonsense from any bird. She had plucked Olivers head as she became hormonal and her own chest feathers to some degree too. She is feisty and although the smallest can really stand up for herself! She lives with all the rest of the flock but it seems no bird can steal her heart like Oliver did and she will miss him for the rest of her days. We hope she is happy, she preens with Spartan and Archie and spends the day bossing everyone around, perhaps she`s trying to fill Olivers shoes! 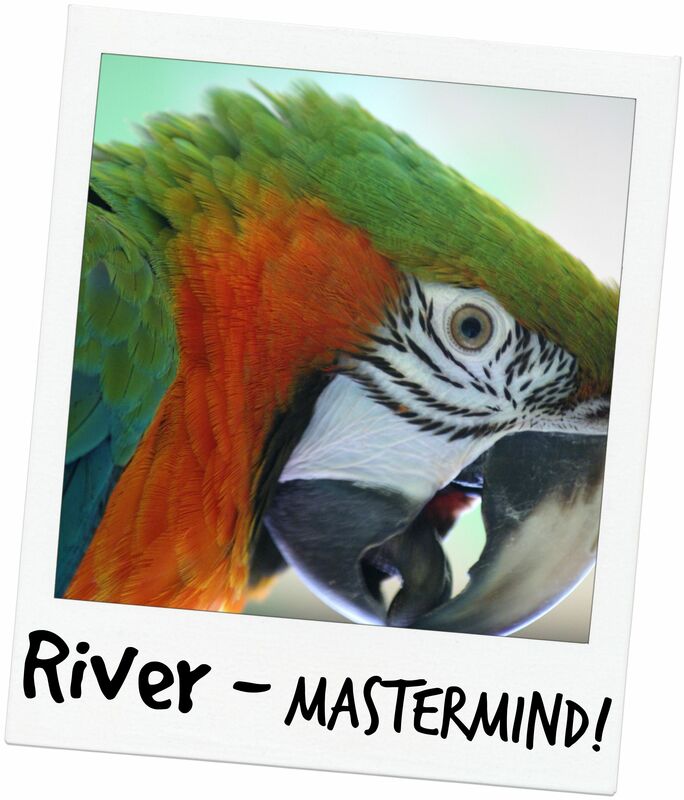 In the last year River has started to speak more and more, she mimics all the other birds, picks up their most annoying habits and can get them into trouble making us think it`s them! Unfortunately for us her ability to count has stuck at 1, and after an hour of 1,1,1,1, we will be glad of the day when she reaches 2!!! He tests toy durability, if a toy lasts Diesel a while we know it has to be good! 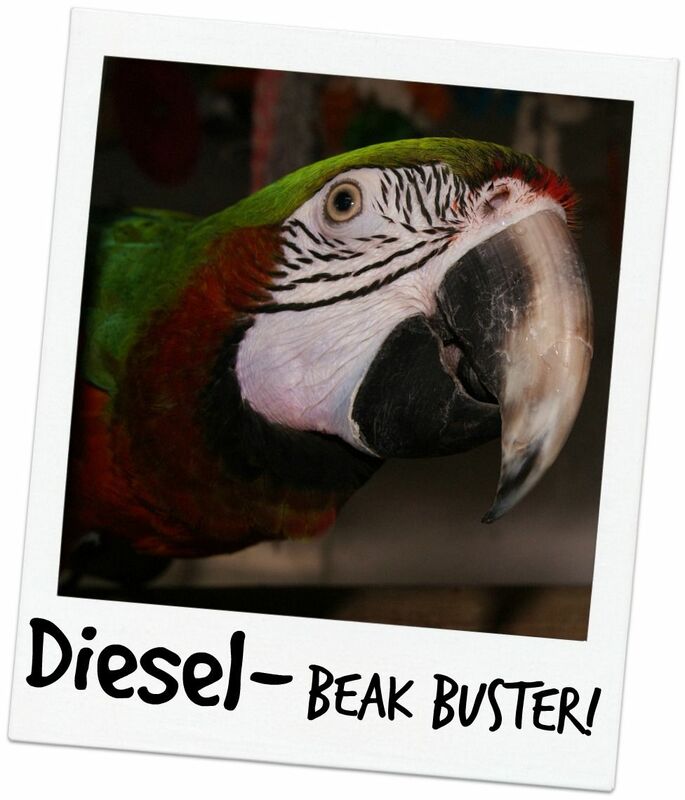 Diesel was first a 'trophy bird', thought of by his owners as something to show off. He was then with a friend who sadly had to part with him.Since living with other Macaws he choses their company over humans though he will step up on command, he is a mummys boy. He will bite without warning though so you really have to watch Diesel! Diesel is terrible for pulling other birds tails, a typical macaw trait but one he seems to have inherited more than the others! I have to be very careful not to make eye contact or handle him around the others as he gets very nasty with them if I am around. Quite the acrobat Diesel spends half of his life upside down! We don`t know why, maybe he just prefers the world at a different angle! The main problem with Diesel is that when he is around humans he tends to fight with other birds, he is best left amongst his own kind. It`s not as if he doesn`t have enough toys to chew to keep him busy! Matilda may be our dainty little Blue and Gold girl but her love for her dad has no bounds and woe betide anyone who enters uninvited! If her menacing stance doesn`t drive them off, wings spread and beak ready to pounce her screaming soon will! 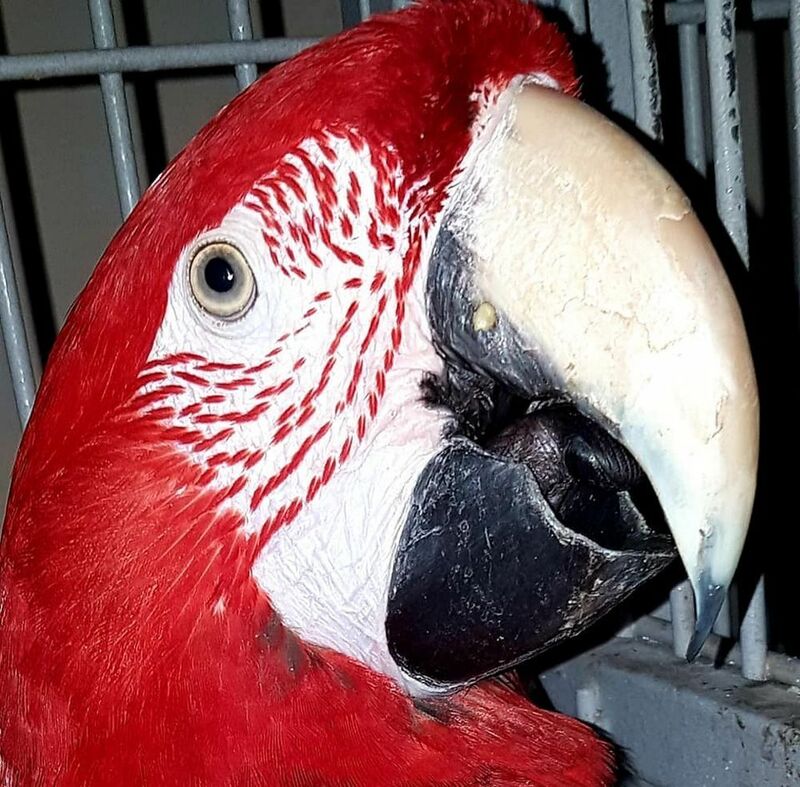 Matilda, previously known as Rambo!, was well loved by her former owners but they were misguided with their love and misunderstood the needs of a parrot. She was kept on a dark landing in a small dirty cage where she had no feathers on her neck at all eating junk food. Matilda lives free in and on her cage alongside the rest of the flock but she prefers her own space a lot of the time which is why she has a cage to herself. Dylan raids her food bowls when she allows him to mind you! In her cage Matilda loves nothing better than to play with her toys, she`s a dainty bird and unpicks them strand by strand testing out the fun factor. She is now in perfect feather and although still a picky eater she is more willing to eat fruit and veg and try new things. 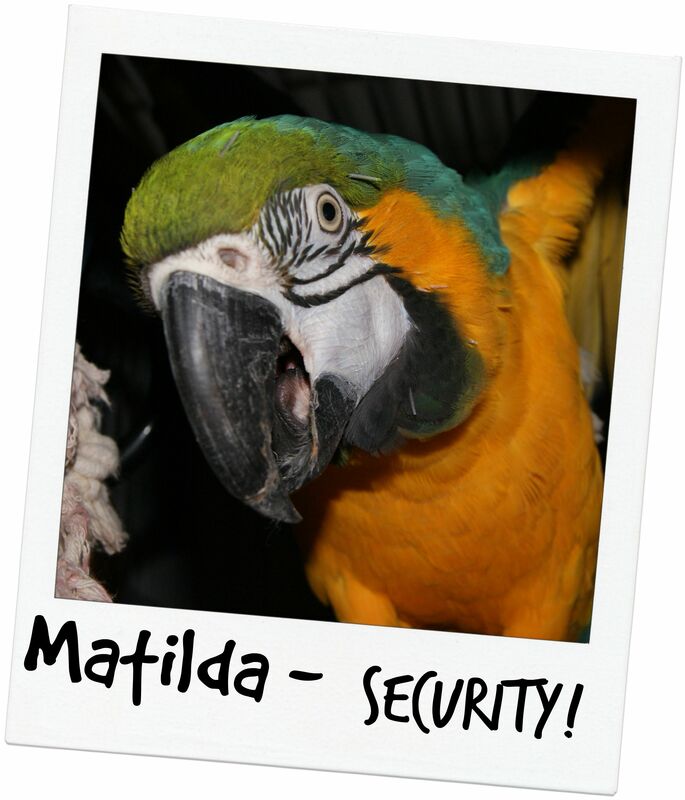 Princess Matilda is not a bird, she`s sure of it, and doesn`t want those nasty bird creatures coming too close! She`s the first to alert us to anyone walking by or up to the door. She has a strange habit of keeping a feather in her beak and rolling it on her tongue, she always has done this, maybe it is a comfort to her. She is thought to be in her 20`s maybe older and you can see she has some arthritis starting in her feet. She is a very steady, well balanced lady happy in her own space. Dylan is our 8 year old Blue and Gold who still has all the cuteness of a baby bird. He loves to count and checks all your orders to make sure the right quantities are sent out. There is the slight issue of the number '3', Dylan doesn`t like it! So Dylan counts ' 1, 2, 4, 2' which can complicate matters!!!! Or sometimes 1,2,4 boo! He is another bird who was loved by his previous owners but they worked long hours and he had a very bad wing clip as a baby. He has grown into a strapping young man and his dark brown eyes melt the hearts of many however he has absolutely no sense of direction when he flies! 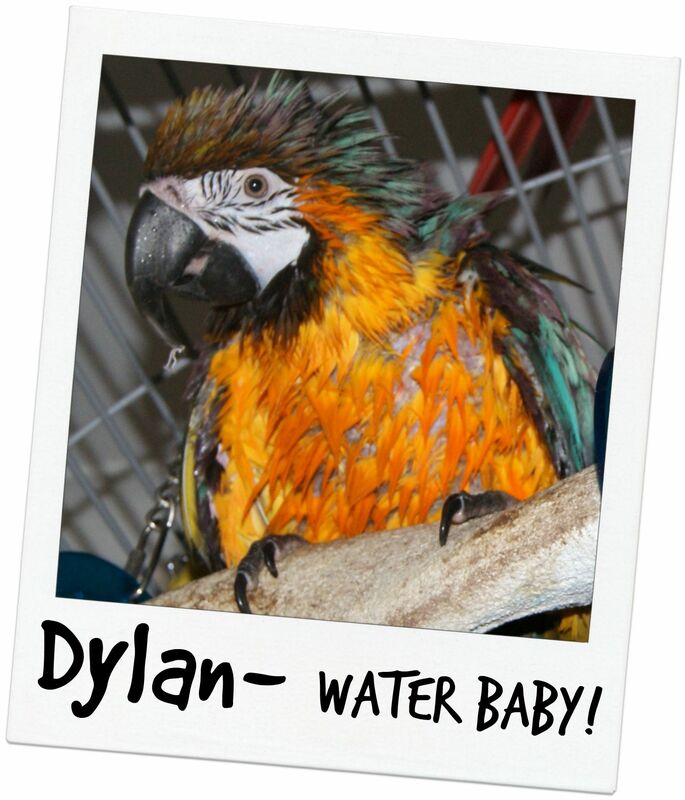 Dylan loves all food but his top tipple is a piece of toast, he eats very well all types of fruit and veg and his feather condition is beautiful probably down to the baths he has. As you can see, he loves a good soaking and a swing dry afterwards! Dylans favourite toy is the Pollys swing where he sleeps at night. This is great as it keeps his nails short. His best friend is Spartan and they share a cage together. Everyone wants to e Spartans best friend but Dylan and Spartan share the closest bond and Spartan won`t settle for bed anywhere other than up on his perch next to Dylan. If you look face on to him you can see he has a slightly crooked beak and also when his crop is very full and he is moulting you can see a small bald patch, but most of the year he looks fully feathered! The vets think this is most likely where he was massaged after being fed as a baby and was always fed from one side so while his beak was still soft it pushed it out of line slightly. Dylan loves to play and throw toy on the floor! 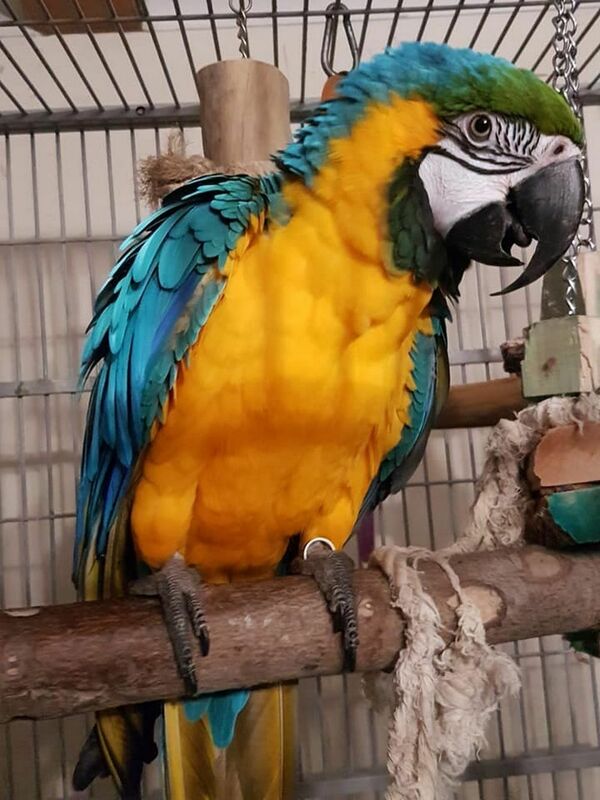 Archie is our 9 year old Blue and Gold Macaw who lives with Spartan, Dylan, River, Diesel and Matilda. He arrived in the flock in great condition and had been a much loved member of a family previously though he had started to give some nasty bites. Archie settled in well with the other birds and took an instant fancy to Matilda, unfortunately she`s not so easily won over though she seems to like Archie more than Dylan and Spartan! 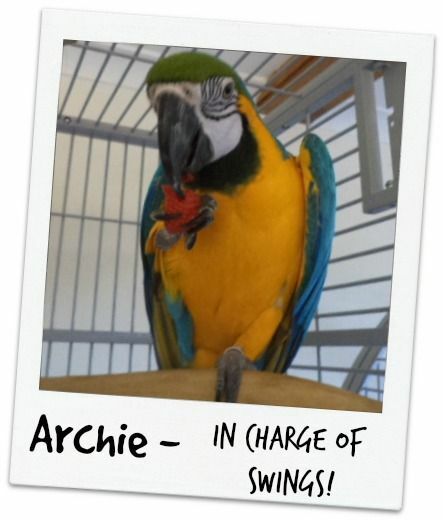 As Archie arrived as the new website was being built we`ve employed him as Head Of IT Department, but it appears he is more of a swings kind of a guy. he just loves his wood and rope swings the most and will hang upside down from it for his bath, sleep on it, and take all his favourite toys and foods up to it. We think he`s done a good job! Archie is a confident bird who doesn`t know how to behave amongst the other birds and does cause a lot of arguments in the flock. He makes the perfect friend for Dylan as they both love nothing more than FOOD!, however, Archie feeds and preens mostly with River and Spartan. He`s just hitting his naughty phase where he`s trying his luck a little! We have a lot of threatening postures, he`s trying to be dominant with the other birds and he needs a firm hand to keep him controlled, but that will pass and he still likes his head tickles and steps up fine. He loves to regurgitate to rope toys, maybe that will be his next vocation!! 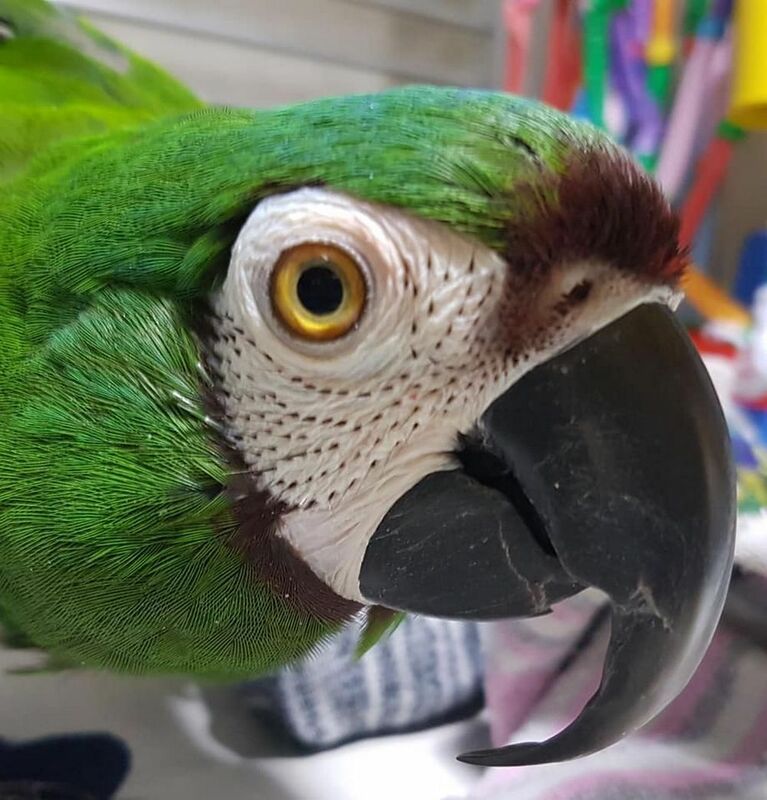 Spartan is just 7 years old and has joined our flock. He loves to remove toys, fastenings, nuts, bolts, he`ll test them all. 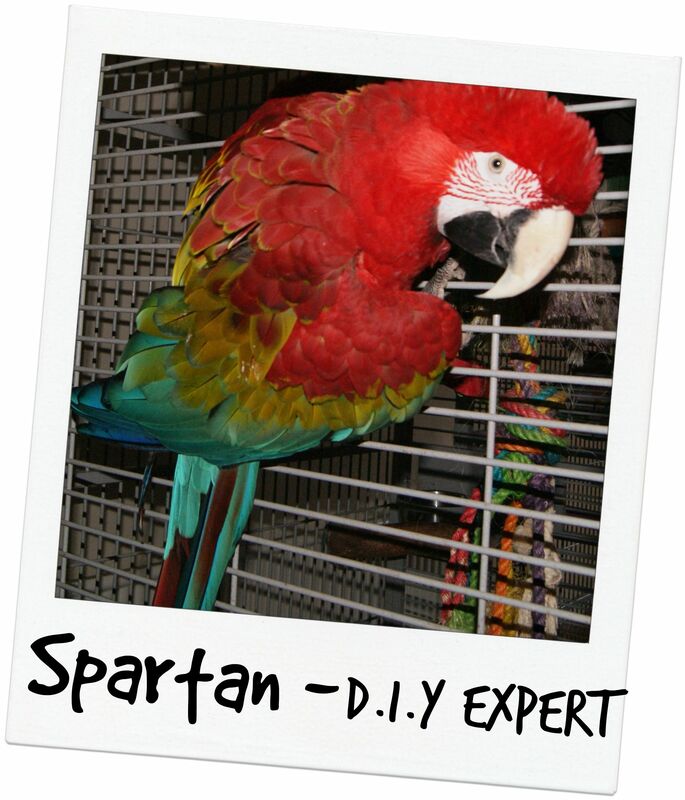 Spartan is quite a large Greenwing and his huge beak doesn`t take much effort to destroy things. He has found a friend in Dylan and within 10 minutes of meeting eachother they were feeding and preening eachother which we thought was extremely fast! They have shared a cage together ever since as Spartan is not happy to sleep away from Dylan. Spartan is of the age where he`s liking to test the boundaries a bit and needs a confident owner. He was much loved by his former owners but due to personal circumstances they could no longer care for him. Spartan has also confirmed that if you squeeze tight enough 2 large Macaws can sleep on the Pollys Swings together!!!!!! He flies well, he nodds his head and does a Mutley laugh when you ask him, he loves most food, he`s a very good eater and of course, has to share the same bowl as Dylan! His favourite thing ever is to flap his huge wings!! His nickname is Spartie and it`s difficult to find any pictures of him without his buddy Dylan in there somewhere! 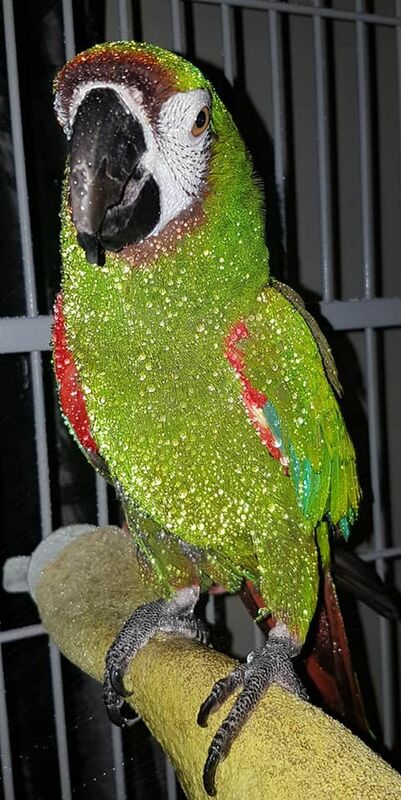 Spartan hated a bath for years, but in the last year has decided it`s the most wonderful thing ever, it`s such a pleasure to see him upside down flapping enjoying a soaking. He`s always removing the quicklinks from toys, sometimes from the swings while the other birds are sat on them!! Crafty boy! Where do we start with Harley?!! Having a wide vocabulary we put him in charge of customer relations. Let`s just say it was bad for business!! We are leaving Harley to concentrate on his autobiography known as Harleys Diary to keep our customers up to speed on the latest goings on. Of course he likes to test the bowl flingability and works on our new toy ranges. 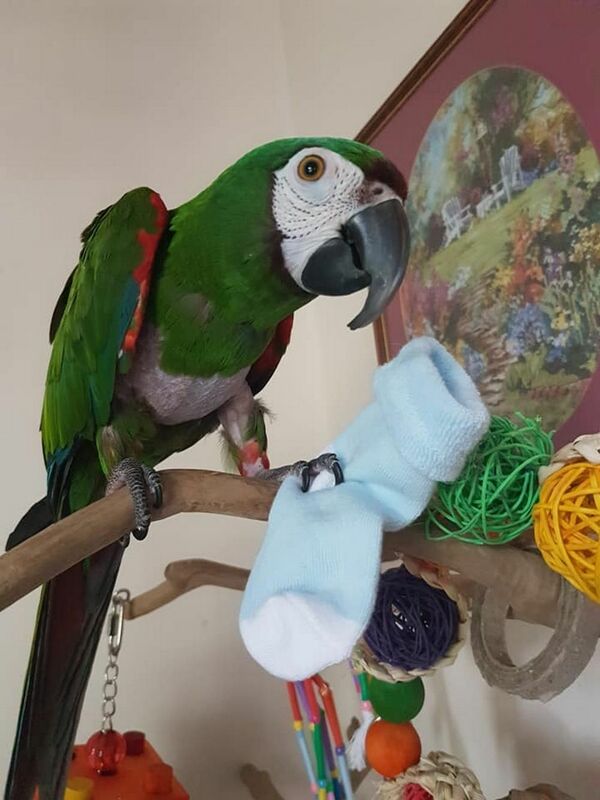 Harley was hand reared by a lady who never put him in the cage so he doesn`t understand how to play but lately he`s been loving some of our toy ranges, even he can`t resist! That owner then parted with him after 7 years and it broke his heart, he went on to a home where he was pulled from the cage by his neck and was going to be set free, then on to a home where he was shouted at and hated and shut away. A journey in the back of a dark van, in his cage which was not secured down was probably the tipping balance. Now he has found love with us he has latched onto his mum and is over bonded, but an extremely loving and funny character. He has a wicked sense of humour and loves to wind people up and then laugh. He shares a cage with Lucas another Severe Macaw but Lucas hates me, so that causes some fights. They sleep together on the swing but Harley then spends most of his day with me. We`re thinking 'debt collector' may be a fitting new title given his lack of fear of everyone and everything! 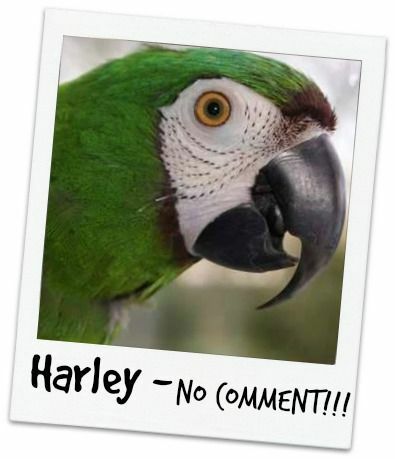 Harley doesn`t realise his size, we have to treat him like the bigger Macaws, though he has a very loving side and in his jumper lies all the dummies from the binky ball and a set of ping pong balls known as 'his babies'. He`s 15 years old now and every year goes through a hormonal period where he will even attack me. This can be hard, I still let him out, but sit very still and hope for the best, he doesn`t want to attack me...he just can`t help himself! Harley is very sensitive underneath all the bravado, and he does pluck himself. Generally pin feathers, but his bald patches are sometimes worse than others.He loves to get out and about in his travel cage for walks around the village, stopping off to see Jemima, the absolute love of his life. She is a beautiful duck, living with our neighbour and their family. He LOVES to pose for the camera! 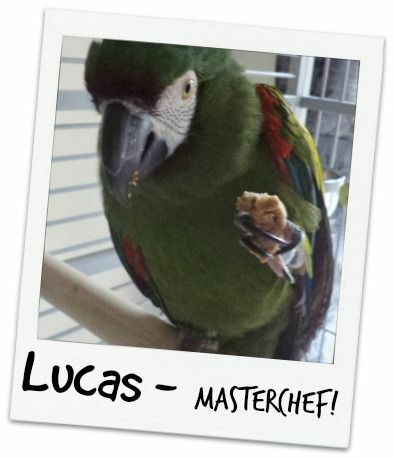 Lucas is also a Severe Macaw but is the complete opposite to Harley. He likes nothing more than to eat and the role as Masterchef is absolutely perfect for him munching his way through pellets, seed, treats, you name it he`s tried it!! Lucas likes to preen with Harley and they sleep snuggled on the swing together. Lucas is tame to men though not a cuddly pet. He comes out of the cage, looks down, sees cage bars between him and the food bowl and scrambles back in, relieved to be back with the food! He only says 'hello' and shakes his head aggresively at most people. He is a well adjusted bird. He hates having his picture taken and on most shots has his head feathers up and beak open warning me off! Lucas is of unknown age but we guess around 15 the same age as Harley. Lucas too seems very hormonal at certain times of the year and will march along the floor of the cage flicking his head! I tried taking him out in a travel cage like I do with Harley but he just never got used to it and was unhappy with it, he much prefers his familiar surroundings, no adventures for Lucas! He will play with most toys, especially when he is angry with me when I clean the cage, he chews the toys, probably wishing it was me he was chewing I think! Lucas was originally called Spikey because he spikes all his feathers up when he`s angry. 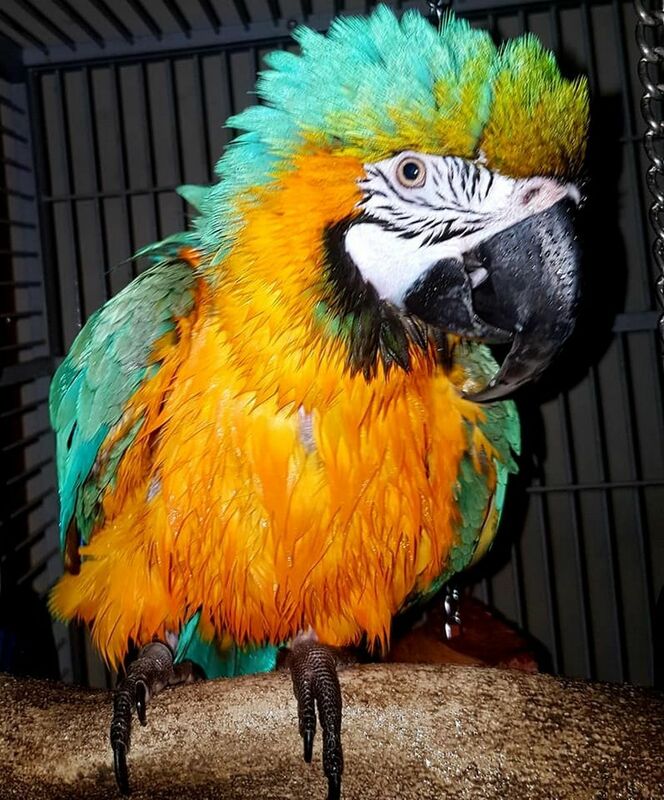 Max came to us with Molly after being kept in an outdoor aviary with no shelter. When they stopped eating they were taken from their owner and we were called late one night to help. Sadly Max suffered Aspergillus and was nebulised twice a day in a special box we made for him. I think he liked some time out away from Molly, she could be the nagging wife at times! Max was 24 years old. 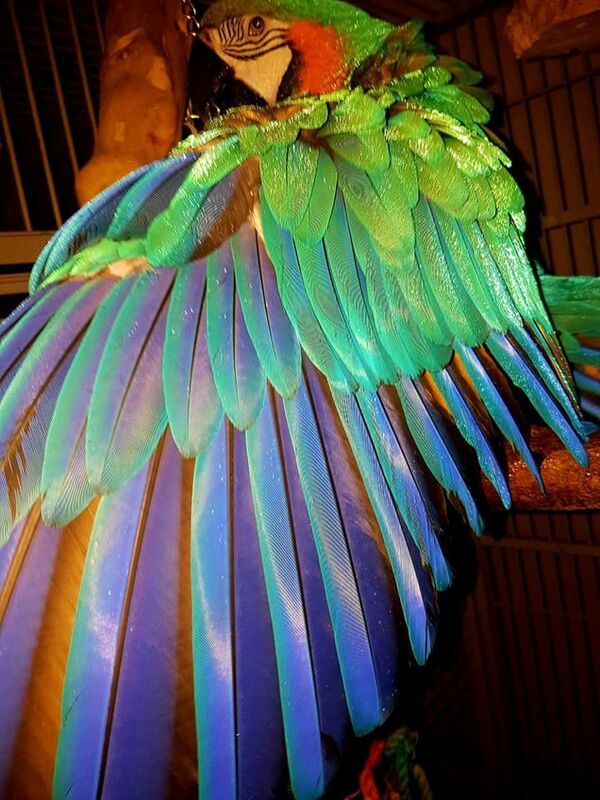 He liked nothing more than to preen, he was chewing his tail feathers but since filling the cage with sisal plaits and preener toys he stopped and spent his time giving the toys tlc and preening them! 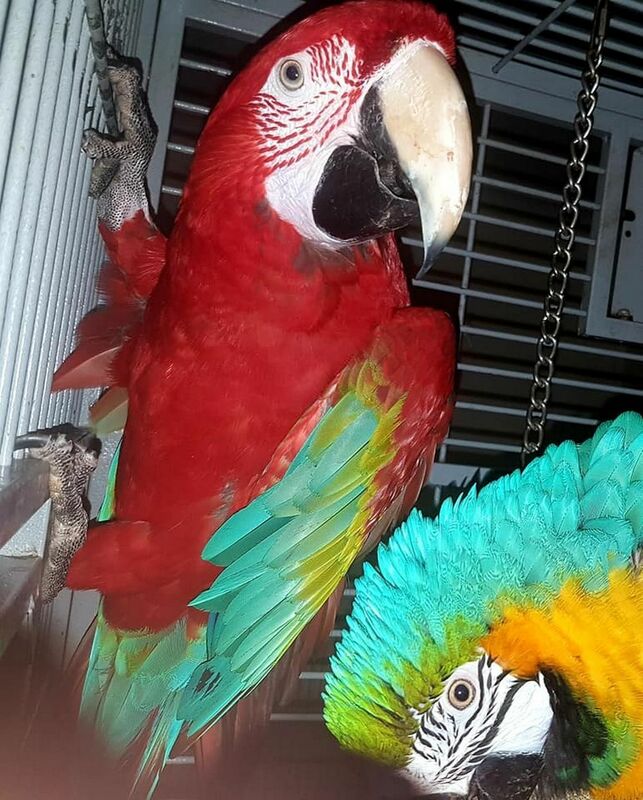 Max was an aviary bird whereas Molly was a pet bird, the 2 were paired up together by the rescue organisation...not exactly a match made in heaven!!! It made it difficult to give them both what they wanted and needed. Maxwell would whisper little words to us, hello and a couple of others we couldn`t quite make out. It is with deep sadness I say Maxwell passed away December 3rd 2012 after suffering a stroke, paralysis and other complications we had to make the difficult decision to say goodbye. 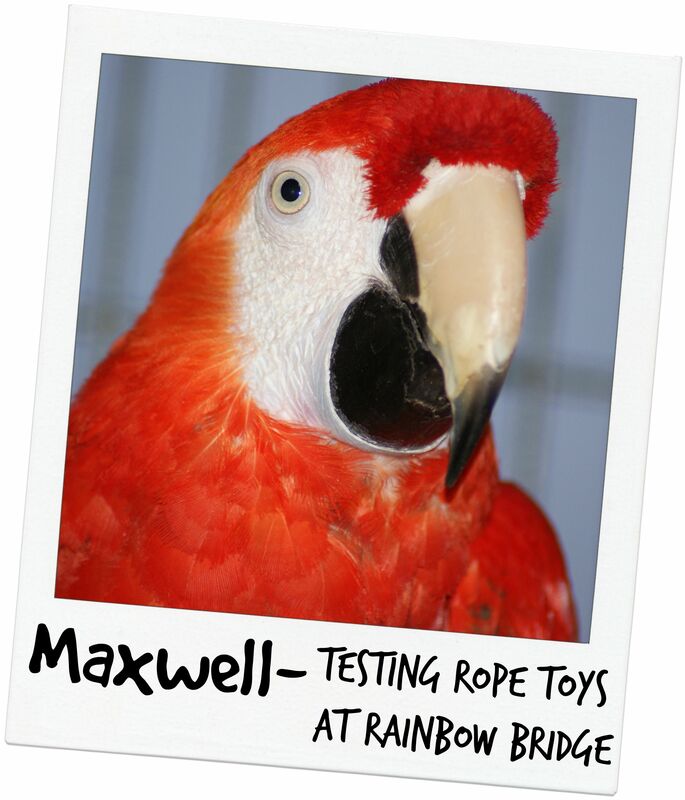 We could never let any of our birds suffer and Maxwell will remain on our pages as part of our staff forever. He was a huge part of our family and we will always miss him dearly, Molly especially will miss him terribly. 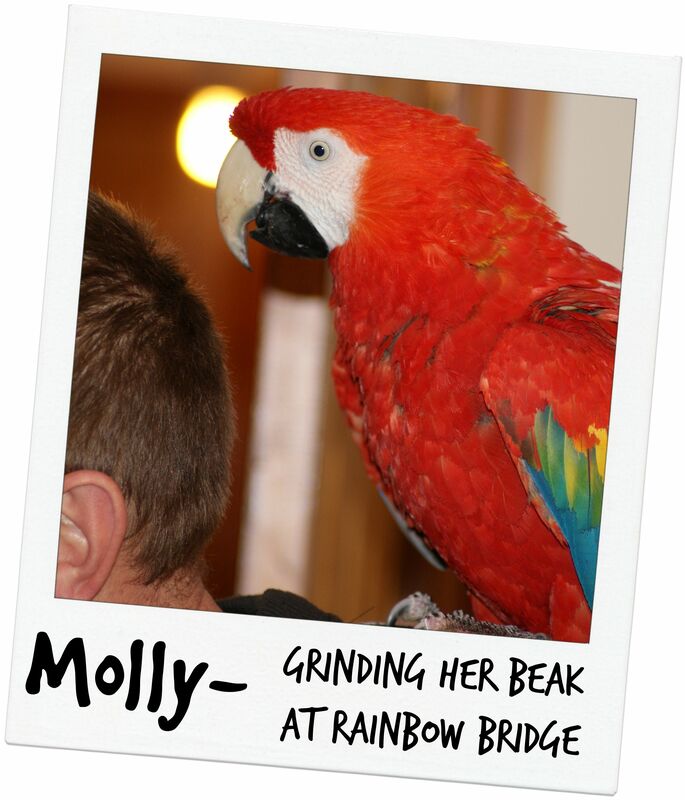 Molly was a tame Scarlet Macaw, well, tame to men anyway! She had a habit of grinding her beak on anything and everything, her cage included. 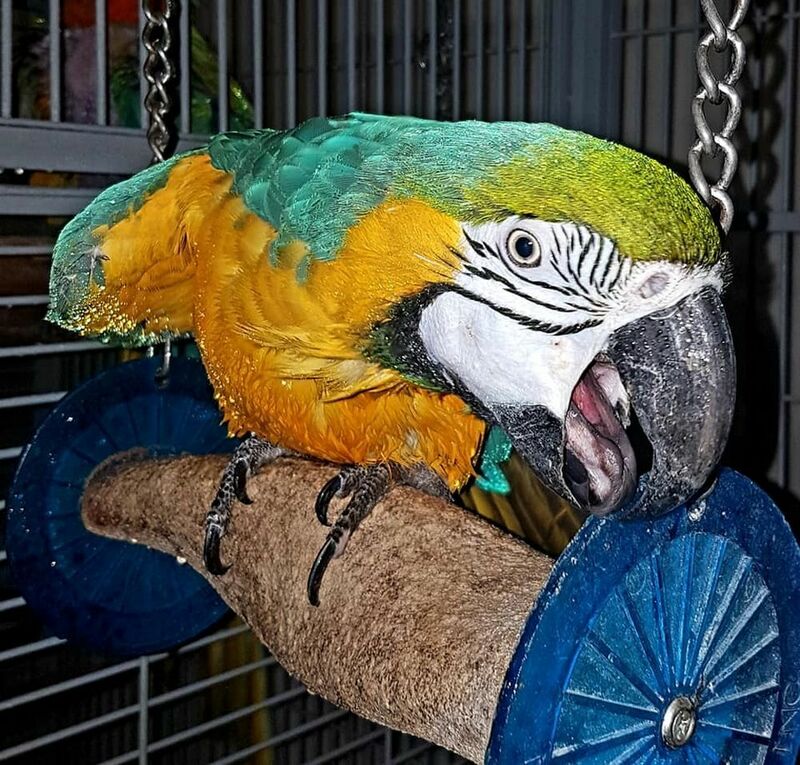 The Beak Buffers and Nibbler blocks saved the paint on the cage and kept her beak nice and trim for biting any women who got too close! Molly was in her 20`s and was in good health but was lacking in calcium and the essentials when she first came in to us. Her desire as a pet bird for humans caused issues with her aviary bird partner Max. She found it confusing and could be aggresive towards him when people were around so her time with humans had to be done away from him. She would attack me and anything of mine she could find, hence the lack of pictures of Molly, she would attack Max and get distressed if we tried to push her too much. She was a screchy noise little lady, with a feisty personality. She didn`t play much but did enjoy shredding toys sometimes. With a heavy heart I have to say that today, 7th February 2013 Molly passed away. She was unwell, had some breathing issues but was feisty and eating although not as well as normal. We booked a vets appointment, picked her up to put her in the travel cage, she wanted none of it and perched on the chair instead! Tristan picked her up and her feet curled, she bit her wing and was gone in seconds. A respiratory tumor and heart attack were the cause. Most likely progressed through the stress of losing Maxwell. Maxwell and Molly reunited again within just a few months and once again our hearts are breaking. As with all our birds she will remain a part of the flock forever and will stay on our pages. A few bonus pictures of our beautiful staff.